SAME HAT! 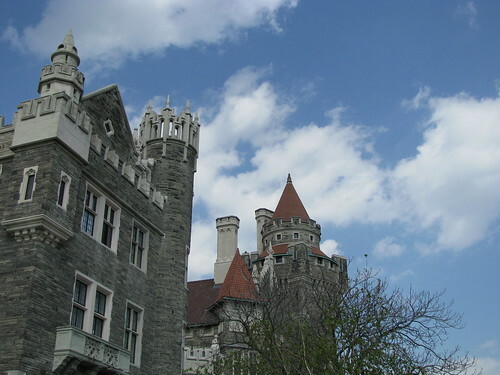 : TORONTO COMIC ARTS FESTIVAL ROUND-UP! As I mentioned last week, I decided this year to skip MoCCA and Comic Con and use that money to head to Canada for the Toronto Cartoon Arts Festival (TCAF). The festival is a bi-annual event featuring cartoonists from all over (and a preponderance of Canadians!). The event is sponsored in part by The Beguiling, and the generous and nice Chris Butcher and Peter Birkemoe (co-owners of the shop) were running around the entire time to make sure things went smoothly. 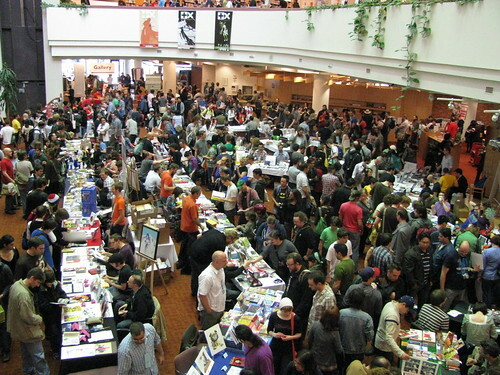 Interestingly, TCAF was held inside the Toronto Reference Library-- a public space with free admission and many non-comics folks doing their normal library business. 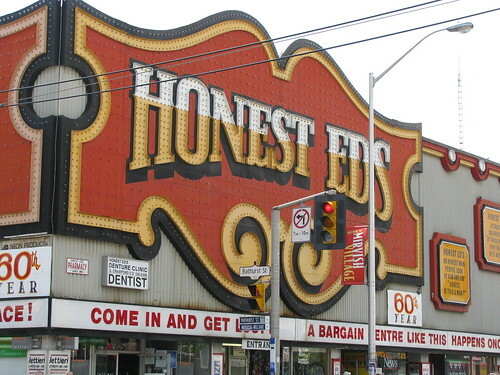 +Visited the Beguiling, arguably the best comics shop in N. America. Their manga and comics selections weren't as expansive as Comic Relief (in terms of raw volume of books), but it felt curated precisely to my tastes-- with lots of international manga and zines! I'll put up a whole post about Beguiling finds this week. 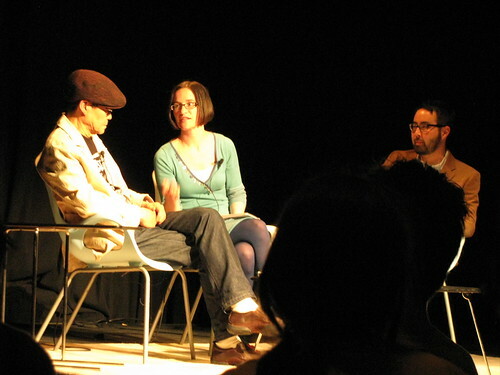 + Attended an event featuring Adrian Tomine interviewing Yoshihiro Tatsumi. I am devoting a separate post tonight to all my Tatsumi sightings and interactions during TCAF, and will share everything there! +Bought self-published comics and minis. There were lots of good finds to be had this year- I specifically avoided any book I could get back home (like from Fantagraphics, Drawn & Quarterly). The best purchases of the trip were interesting newspaper zines, Remake by Lamar Abrams, and some new books by friends. I'll post pictures of the haul with recommendations too! +Hung out in-person with new friends, like Saicoink and Michael DeForge. Both are awesome creators, and were super fun to tool around the show with. While visiting tables, ran into Electric Ant contributors Shawn Cheng, Derek Kirk Kim, Dash Shaw... and had a sighting of the fabled Shigacorn. I also spent a lot of time with manga master Jason Thompson, About.com's Deb Aoki, and my old Toronto buddies Vivian & Matt. NICE! +Attended a few panels. 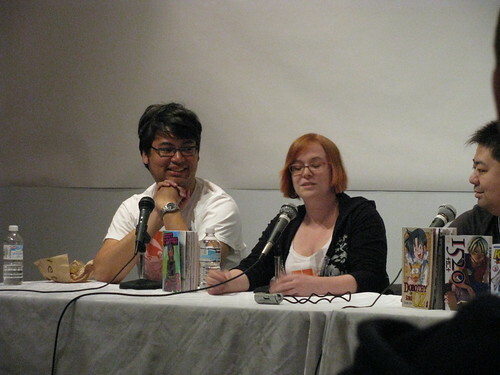 The first was Perspectives on Global Manga, moderated by Deb and featuring a discussion with Bryan Lee O'Malley, Becky Cloonan, the Publisher at Udon, Antoine Dodé, and Jason Thompson about the influence of manga on their works. DeForge and I also attended a panel moderated by the dude from Inkstuds featuring Dash Shaw, Frank Santoro, and some other dudes riffing on how "mainstream comics of the silver and bronze age have a relevance and impact on modern alternative comics," with lots of righteous discussions and images of Kirby, Ditko, and Steranko's work in the 1970s. +Spent a few hours getting my Autograph book signed. I forgot or didn't get up the nerve to ask a few folks, but I was really pleased with the new additions. Check them out at this post. +Lots of last minute purchases, and said congrats to the 2009 Doug Wright Award winners: Matt Forsythe (Ojinbobo), Seth (I did not actually say congrats to him, but was tempted to steal his fedora which I saw laying backstage at an event), and Kate Beaton (Never Learn Anything From History). 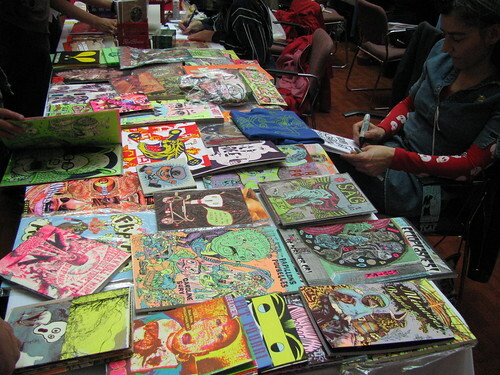 +IN SUMMARY: TCAF was a really rad show, with free admission and a strong emphasis on engaging the Toronto community. While I dug MoCCA last year, I'm super glad that I skipped it (and SDCC) to make this trip happen. Many kudos to Chris Butcher and the entire Beguiling/volunteer corps. crew for pulling together so many indie creators and international cartoonists in one spot. I'll definitely be there for the next one, in 2011. THE REST OF THE POSTS (AND PICS/VIDEOS) COMING VERY SOON! @Michael: Good times! I didn't blog about sharing a bottle of Jameson at a house party with you guys, but that was a highlight of the trip! Darn, I wish I had gone! I've seen tons of pictures, looked so cool! I got the first issue of electric ant at forbidden planet, it was great! Can I send you some of my comics? I was looking for an email on your site but couldn't find one! Hi jogs6000-- thanks for commenting and glad to have you! Wow, so at least one copy sold already at Forbidden Planet :) I really appreciate you picking it up and taking the time/spending the money to check it out-- that means a lot! I'd love to check out your comics... The first issue is pretty much set on content (and pushing 128 pages this time! ), but there are one or two things (gag strips, specifically) that might be able to fit in? I'm always super interested in checking out new comics and keeping a list running for issues 3 & 4 already... We can talk over email, hit me up at electricantzine [AT] gmail [DOT] com !